The Digital Library of the Middle East (DLME) is designed to provide global access to significant collections of cultural heritage material from around the world. Accompanying that important service is a critical cultural heritage preservation effort. By providing inventories, cataloguing and documenting objects, and digitizing records, the DLME directly supports the worldwide effort to combat looting and the illicit trade in cultural heritage objects and pushes back against the forces that would plunder our culture to finance terror and oppress people. Inventories allow museum and library directors to know exactly what they have in case of catastrophic loss. Digitization and federation into the DLME makes records available to law enforcement colleagues around the world. Cataloguing provides provenance information to investigators and the art market. And photographic and 3D documentation allow for identification of objects that have disappeared due to illicit trafficking. This exhibit explains how the DLME works with partners around the world to help preserve and protect our shared cultural heritage. Providing concrete documentation is one of the first challenges in trying to stop the sale of looted cultural objects. The impact is amplified when documentation is digitized and made accessible online. By providing a platform for inventories of digitized cultural heritage databases, the DLME helps secure collections and assists international law enforcement protect artifacts from trafficking by making those objects readily identifiable and records readily accessible. In 2015, US Special Forces conducted a raid deep in Syria against ISIS commander Abu Sayyaf. Found in the operation was a stash of artifacts and paperwork that government sources say conclusively proves that ISIS was trafficking antiquities to fund its operations. Among the finds were objects that included registration numbers from the Mosul Museum that were looted by the terrorists. Because the museum had inventoried and clearly marked the objects, they were easily identifiable and repatriated to the Iraqi government. The DLME actively encourages new inventory and digitization projects through joint fundraising collaborations with Middle Eastern partners. These newly inventoried and digitized collections become easily accessible through the DLME digital platform, directly implementing this UN mandate. In 2003 when the Iraq National Museum in Baghdad was looted, thousands of artifacts went missing. Artifacts excavated from famous archaeological expeditions like the excavations of Ur in Iraq in the 1920s fell victim to the looting. Fortunately, documentation of objects has not only helped law enforcement search for items, but track them down for return. Assyrian statue in the National Museum of Iraq in Baghdad. Iraqi flag being carried up the stairs at the ancient site of Ur. American soldiers learn about the National Museum of Iraq in Baghdad. Documentation in the DLME is not just a valuable tool for countries to prove ownership of an item, it can also serves as evidence for prosecutors bringing charges in illicit trafficking and other criminal cases. 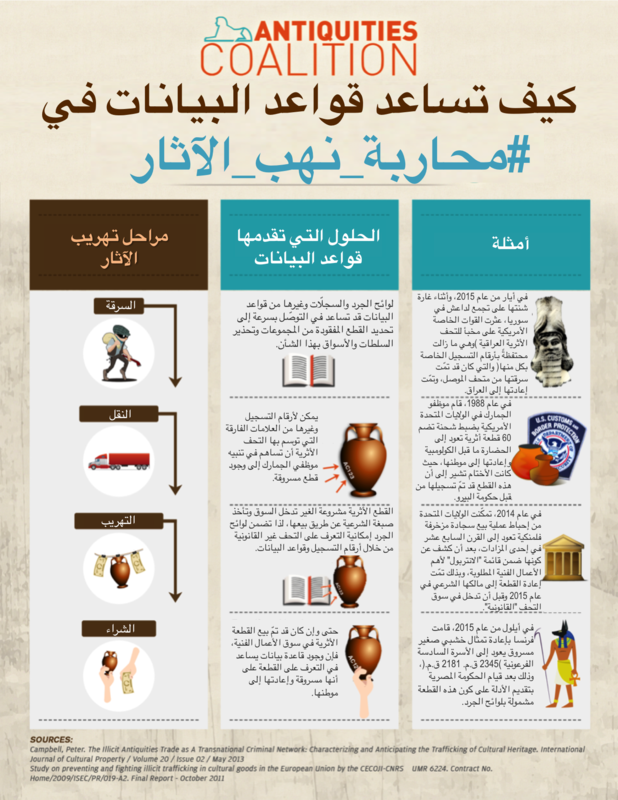 Comparing forfeited or seized materials with documented artifacts like those found in the Digital Library of the Middle East can provide evidence to support law enforcement. In 2006, the United States returned the 4,400 year old statue of the Sumerian King Entemena of Lagash to Iraq after the artifact appeared in the FBI’s Top Ten Art Crimes. Documentation of this artifact and the sharing of information through the FBI Art Crime Unit helped secure the statue’s safe return. Another way the DLME can help is with customs enforcement. Because the database is readily available on smartphones and tablets, customs officials around the world can check comparable photographic records and look for similar objects when they are faced with a questionable import. Stylistic similarity can alert officials to seek expert guidance in establishing the legality of imported objects. The DLME also provides provenance records when available. These show the history of ownership and when, how, and from whom an artifact was acquired. It helps establish that an artifact is not a forgery, been altered, or was looted and illicitly trafficked. These data are critical for the investigator and the art market by helping to establishing legitimate ownership of materials. Sidon Bull's Head Statue stolen from Lebanon during the Civil War. Documentation is especially important for objects that are often at risk during conflict. In 1967, French archaeologist Maurice Dunand discovered the Sidon Bull’s Head at the Temple of Eshmun in Lebanon and turned over to the national government. As Lebanon’s civil war widened in 1979, the artifact was taken to an underground bunker for safekeeping where it stolen. After surfacing on the U.S. market and being acquired by American collectors, the Bull’s Head was loaned to the Metropolitan Museum of Art, which was unaware that it was stolen property. But Dunand had catalogued and photographed the find, and in 2010, his documentation was handed over to the Lebanese government. Met Museum Director Thomas Campbell notified Lebanon that they had matched the Bull’s Head to the Dunand archives. The Manhattan District Attorney seized the artifact in the summer of 2017, it was repatriated to Lebanon later the same year. Temple of Eshmun in Sidon, Lebanon. Repatriation ceremony of the Sidon Bull's Head and two additional statues to Lebanon. UNESCO advocates the value of access to one’s heritage and history as a human right. Much of that personal history exists in the kind of records that so many families and communities maintain - birth certificates, family trees, deeds and government records, religious materials, and photographs. For many displaced people in the Middle East, especially in conflict zones, these records are under threat from destruction caused by conflict. Iraqi refugee children at Newroz camp where they are being helped by the International Rescue Committee. The scourge of looting and illicit trafficking affects manuscripts and other library collections as well. Katie Paul of the Antiquities Coalition has identified social networking sites that offer books and manuscript materials for sale from users across the Middle East and North Africa. The lack of provenance and nature of the sale and communications suggests that the material is stolen. Unprovenanced manuscripts offered for sale on social networking sites. 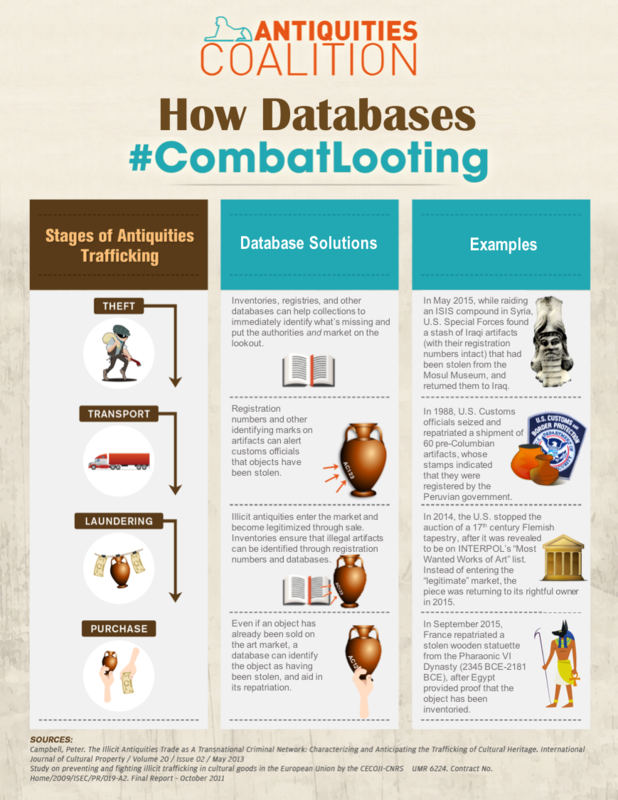 These infographics developed by the Antiquities Coalition provide a summary of how databases like the DLME combat looting. The Digital Library of the Middle East focuses on materials from the MENA region and gratefully federates any appropriate collection of Middle Eastern content from any region of the world. However, we are not alone in recognizing the importance of inventories, digitization, and access. Digital Libraries throughout the world are building collections with the goals of access to important information and of securing collections. Our report, Implementing United Nations Security Council Resolution 2347: The Critical Role of Digital Libraries was submitted to UNESCO and reports on a sample of major international digital libraries and their exemplary work of international cooperation and cultural heritage preservation. With the Digital Library of the Middle East, we are implementing a solution that will help protect collections, fight against cultural racketeering, and provide resources to help increase security and reduce risk for cultural heritage material at risk. The value of our shared cultural heritage is inestimable. And nowhere is that more evident than in the Middle East. In this short video from the Antiquities Coalition, Iraqi Foreign Minister Ibrahim al-Jafaari eloquently expresses how cultural heritage can unite people the world over, offering words that inspire all who collaborate to preserve our past.